There are a few things that you only find in coffee shops. You would really love the crowd, chatter and that environment that smells of coffee beans. But, as it happens, froth-rich lattes and cappuccinos aren’t one of them. For years, people have believed that they cannot make those beautiful coffee drinks at home. For one, I too believed the same. That was until I understood the role of frothing. Now, let’s set this straight: making milk frothing and getting it right isn’t easy. You’d need practice if you like to master the art. At the same time, you would need one of the best milk frother products as well. A milk frother to a cappuccino-maker is what a knife is to a chef. Of course, you should know how to use it, but, more importantly, you need the right knife — or, milk frother in this case. In this article, we will have a look at some of the superb milk frother solutions in the market. The list comes with multiple types, including handheld, automatic and manual. You may want to choose one of these frothers if you need that perfect latte or cappuccino. Are you looking for a completely automated milk frother with additional options? In that case, the Breville BMF600XL Cafe Milk Frother is the best option. The 4.6-star rating on Amazon isn’t for nothing. Professional coffee-makers and coffee enthusiasts love this frother when it comes to making lattes and cappuccinos. Because of the dual frothing discs for lattes and cappuccinos, you have more control over this milk frother. You can choose the right disc based on whether you want creamy or smooth milk. 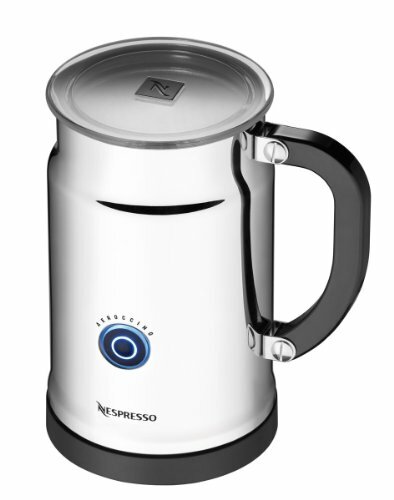 The package comes with a stainless-steel jug that can be used for frothing and serving thereafter. You can count on Breville BMF600XL Cafe Milk Frother for frothing up to 500ml of milk at once. Thanks to a highly-efficient heating element, you can achieve temperatures up to 160F. You can use whole milk with this for best results as well. We should repeat that the Breville BMF600XL is a complete package. If you are someone who makes lattes and cappuccinos so often, you may want to consider this. Just so you know, you can use this device to make hot chocolate as well. For what you are paying, you get a completely automated, controllable system — and that’s great. If you think the previous one is a bit expensive, you should consider the Epica Automatic Electric Milk Frother. It’s a toned-down version that allows you to froth and heat milk. It comes with three settings — cold froth, hot froth and hot milk — and you can choose based on your needs. We would say that the design and construction of this frother is more practical. You can place the carafe on the heating element, get the job done and take the same carafe for serving the froth. We found it suitable if you are planning to froth non-dairy product as well. One difference is in terms of capacity. You can froth up to 125ml of milk at one go, but the heating capacity is 250ml. It should be noted that the heating element is so effective and the vacuum insulation also helps in the process. 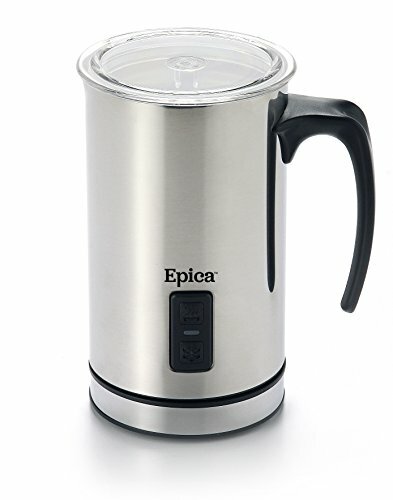 Although it takes a bit more time, Epica Automatic Electric Milk Frother can reach a maximum temperature of 150F. We also loved that you can cool the milk if you are making a cold beverage. In fact, you are spending less for more features. If you need a versatile, automated milk frother, Epica Automatic Electric Milk Frother makes sense. Here is the third and last automated milk frother in the list. Nespresso Aeroccino Plus Milk Frother is trying to bring the best of both worlds. In terms of construction, it’s really impressive and there are more features on the inside package. As we had seen in the second option, this milk frother offers three different options — hot milk, hot froth and cold froth. The heating and cooling elements are standard and the heating time is 70 seconds to reach a temperature of 130F. If you are trying a higher temperature, that could be a limitation. Just like the other products we discussed, Nespresso Aeroccino Plus Milk Frother is also easy to use, clean and maintain. That having said, you may need some extra time to master the controls. The top capacity for frothing is set at 130ml as well. While the product does not have any issues while using, the only area of doubt is the non-stick coating on the inside. Some customers have reported it, but we think you can ignore the issue by cleaning the frother after every single use. If you need the frother to have better build quality, go for the Nespresso Aeroccino Plus Milk Frother. If you are looking for the best handheld milk frother in the market right now, you cannot miss this. Aerolatte Original HandHeld Milk Frother comes in two finishes and you can get a version with a stand as well. So, you can make it an addition to the kitchen countertop as well. As it happens, it’s also one of the most powerful handheld milk frothers available in the market. You will be able to froth the milk within 20 seconds or less, which is great. This would be the perfect solution when you need a quick cup of latte or cappuccino. The biggest advantage here is that you don’t have to worry about the quantity or type of milk. It doesn’t matter if you have cow milk or soya milk, frothing would be as easy as it gets. While it does not come with a heating/cooling element, you can use the frother for all sorts of drinks. Aerolatte Original HandHeld Milk Frother is also one of the highest-rated handheld milk frothers on Amazon, making it a reliable choice. It comes with two included batteries: meaning that you can start the frothing as soon as you open the box. Go for it if you need something affordable, handheld and easy to use. There are times when you need more control over the frothing process. That is when you should consider a frother like HIC Milk Creamer Frother. It’s a manual milk frother, meaning that there are no discs or hardware of any other sort. You need to do the frothing. You can fill the milk inside the container and move the piston up and down to do the frothing. Although the frother does not show you the milk while you are frothing, this wouldn’t be a problem for who have enough experience in this matter. On the bright side, the construction of HIC Milk Creamer Frother is impressive indeed. You need not worry about practical issues on the way. Just so you know, you will have to do the cooling/heating before you put the milk into the container. Also, unlike many of the electric models that we talked about, this milk frother is dishwasher-safe. You can clean the whole system easily once you are done. On the other hand, we would not recommend this to new enthusiasts or to someone who makes way too many cappuccinos a day. 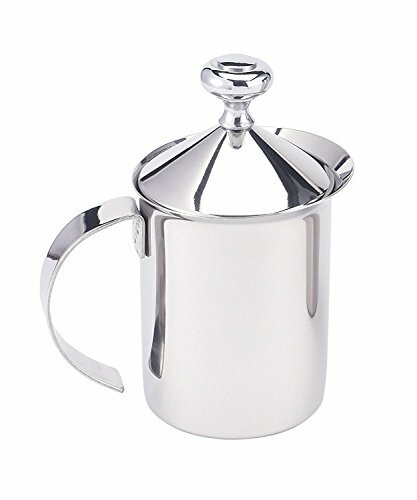 Go for the HIC Milk Creamer Frother if you need something more controllable and inexpensive. Above, you have seen some of the most popular and widely used milk frother options in the market. Despite all these, if you are new to this genre, you would need help in choosing the right one. So, here are just a few things you should know about milk frothers to make the right choice. Although coming in multiple forms and sizes, milk frothers are devices that you can use for frothing milk. As you know, milk frothing is necessary when you are making an awesome latte or cappuccino. It isn’t just about the taste but also about the feel and looks. So, if you don’t want to rush to the coffee shop every single time you need a cappuccino, you should consider getting a milk frother. Now, getting a random milk frother is an easy job. But, getting the right milk frother for your actual needs is an entirely different matter. Which Type of Milk Frother To Choose? First things first, there are different types of milk frothers you can choose today. Each type comes with some advantages and disadvantages; knowing them is very important in the long run. As the name says, a handheld milk frother needs to be held by hand. There are two main parts — one, where the motor and the control system are placed and two, the frothing disc. When you power the device on, the frothing disc would start rotating, thus frothing the milk. The most important thing here is that you need not worry about the capacity of milk. Of course, the speed may vary, but you will be able to froth around one liter of milk using these devices. Last but not least, handheld milk frothers are comparatively inexpensive. You can have it for less than the price of a high-end cappuccino. So, these milk frothers come with a jug where the milk is stored. The main parts of this system would be the motor that rotates the frothing discs and the container. You will have to pour milk into the container, turn on the machine and it would start frothing. However, if you have a manual jug-type milk frother, you have to take the effort. You will have to move the plunger-like structure up and down for doing this. It’s somewhat like the French Press coffee makers. With the automated milk frother, you have to put in less effort and can get the right type of frothed milk all the time. With manual machines, however, you will have to master the task. Choosing the right type of milk frother depends on your level of expertise and needs as well. As you may have noticed earlier, most of the automated jug-type milk frothers come with additional features like a milk boiler and a milk cooler. So, you would not need an extra heater/cooler for making beverages. How to Buy the Best Milk Frother? 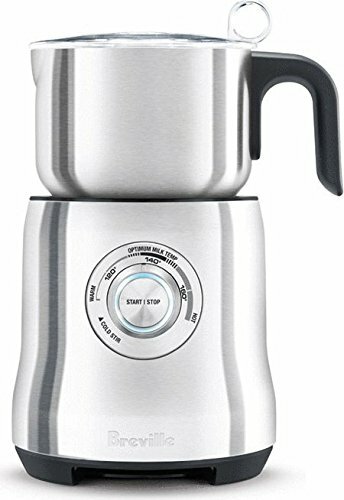 If you are planning to make real-hot beverages, you should consider the maximum set of temperature that the milk frother can get. Of course, this is applicable when you are getting a jug-based, completely automated device. In the same way, you may have to check whether the device has a cooling element. You can actually ignore this if you are someone who makes a cappuccino a month. We hope not, and if you make a lot of beverages, you should consider the build quality of the device. This way, you don’t have to worry about consistent cleanings or usages. It also means an investment, but something that would come back to you. Additional Features also matter in the long run, especially when you are spending a bit more. Some of the suggestions, for instance, allow you to make drinks like hot chocolate and other beverages. If you are someone who doesn’t stick onto classic coffee, you would love these features for sure. A set of extended controls is also a great feature, so to speak. Now, you should have one of the superb milk frothers you’ve ever imagined, but there’s something. It’s important that you learn as many things as possible about the milk frothing process. For instance, make sure you don’t over-froth. If you do this, your cappuccino or latte can become worse than you expect. The same way, ensure that the frother gets enough breaker; otherwise, you would compromise performance in the long run. If you want to make those creamy lattes and cappuccinos at home, make sure you have one of these best milk frothers from the market.